Kanchanar Guggul is the important medicine in Ayurveda. It is most famous guggul preparation. 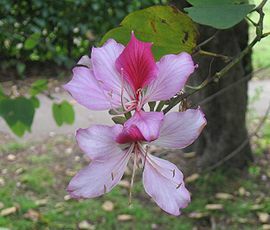 The main ingredients are kanchanar (Bauhinia Verigata ), Bibhitaka(Terminalia Belerica), Haritaki(Termanelia chebula), Marich(Piper Nigrum), Varuna (Crataeva Nurvulasa), Ela(Eleteria Cardamomum), Dalchini(Cinnamomum Zeylanicum). Kanchanar guggul is Ayurvedic Formula medicine for kapha disorder in the tissues. It helps break down deep deeted kapha. The thyroid and lymphatic enlargement like lymphedema condition. Kanchanar has specific action in growths, cyst and all types inflammation, so kanchanar guggul is useful for chronic tumours, abnormal tumours, GI system, mass protusion, skin disorder, unnatural growth like goiter, cervical adenitis, lipoma, warts. It check out growth and promotes ulcer healing. Kanchanar guggul posses purifying and rejuvenating power. Guggul benefit for lipid regulating and immunomodulating properties. Gugguls helps lower blood cholesterol by 14-27% and can lower triglycerides by 22-30%. Guggul also works on liver by increasing the metabolism (or break down). The cholesterol levels lowers several research shows it is benefits as a weight loss and fat burning agents. Thanks a lot for helping me 🙂 ! I am 65 years veg male suffering from Rheumatoid Arthritis since 6~7 years, taking two tablets of Sinhnaad Guggul in morning since last one year. Do not feel much improvement. My both Thumbs are also very stiff and swollen. Pain goes up and down with movements. What should I do? Can you suggest some more effective medicines to make me feel better and cure? sir mera naam naveen h, meri maa ke gall bladder me cancer (tumor) detect hua hai, aur jaundic bhi hai. CT Scan report dekhne ke baad Dr ka kahna h ki ab operation nhi ho sakta meri maa ki age 56 year hai. Sir koi rasta samajh me nhi a rha tha phir patanjali ke baare me suna. Sir plz mera margdarshan kijiye plz plz plz sir……………………………..